A charming cottage in the town of Lymington in easy reach of a wealth of activities. Comprises two double bedrooms, one with a king size bed and the other with a double. There is a spacious lounge with woodburner. The cottage enjoys a super location, with the Georgian market town, its lovely High Street, the Marinas and Sea Wall walks within easy walking distance. There are endless activities, pubs, restaurants, walks, rides, costal walks on offer all within minutes walk or drive if wanting to explore the delights of the New Forest. Lymington and the New Forest will be sure to spoil you and hopefully so will we, making your stay a memorable one. We have ran a small Cottage approximately 4 miles from this property for over 18 months now and have achieved a five star rating and believe we know how to make guests feel welcome and also we have learnt what is important so we have applied that learning in bringing this new offering to the holiday letting market. Becky and myself have lived in Lymington for seven years and couldn't imagine living anywhere else now. Becky is a part time veterinary surgeon and a part time secondary school science teacher. Richard has his own local property business, and is a volunteer on the Lymington Lifeboat Crew. We have three daughters, a black lab and a crazy cat. We recently modernised and refurbished the cottage creating a charming, and still characterful place to stay. The cottage is so close to town and has the benefit of having the marinas, sea walks and parkland literally on its doorstep. It makes for the perfect short break. The Cottage has two double bedrooms, one king size bed and the other with a double. The Haven marina (with lovely Bar & restaurant!) is a few minutes walk and from there the sea wall meanders around the salt marshes with great views of the Isle of Wight and Keyhaven fort. The old market town of Lymington, with its lovely High Street and cobbled street leading down to the Town Quay are also within easy walking distance. Further afield, a short drive takes you into the New Forest. Heathland and forest walks abound and ponies, cattle and donkeys roam free so take your time and explore the delights at your leisure. Fantastic location. Just a few minutes walk to the sea or to the High Street with a great selection of shops, restaurants and coffee shops. The ferry to Yarmouth on the Isle of Wight leaves regularly from the other side of the river and is easily reached on foot, by bike, by car or by train from Lymington station. The cottage has a cosy atmosphere, with a log burner for the winter evenings. On warmer days there is a small courtyard garden and a terrace leading off the 2nd bedroom. The beautiful market town of Lymington which has market day on the High Street nearly every Saturday. Lymington's coastal river. Enjoy riverside walks and even a cruise on the pleasure boat puffin. Smart TV (with integrated DVD) linked to broadband so can use for logging into Netflix etc. The cottage was cosy and tastefully furnished . It was in a perfect location to explore the forest and coast . A lovely retreat ! Gorgeous cottage, perfect location. Every little detail had been thought of. Very clean which is the most important thing to me when staying somewhere away from home. Wonderful break from the chaos of every day life! Would love to return. Thank you! We stayed here for 2 nights in February to celebrate our anniversary. 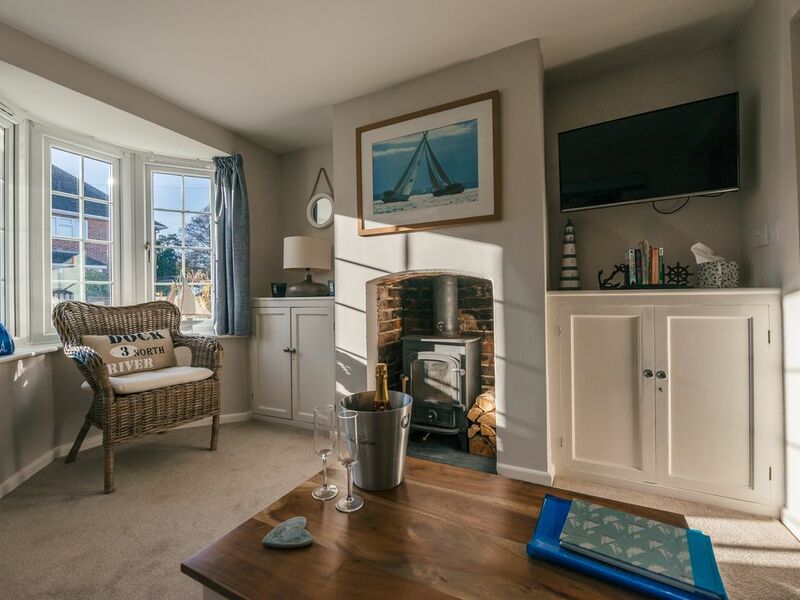 Lovely quaint cottage in a perfect location for walking into Lymington. Beautiful cottage in a great location! Myself and my husband stayed here for the weekend to celebrate our wedding anniversary. The cottage was very well presented, clean and had everything we needed. It is small but perfectly formed! It is within walking distance to the marina; we walked to ‘The Mayflower’ pub and had a lovely meal & had an Indian takeaway from Rivaaz on the high street which we’d highly recommend. Would love to return in the future! Thank you Richard!